My gosh I just love the colors of Fall. This month the album kit is loaded with fall goodies for you to play with . 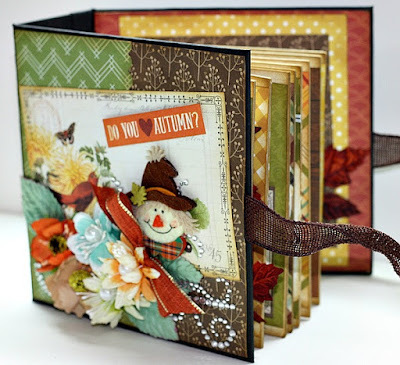 When I received my kit I knew right of way I wanted to make a cover to go with the rings and the chipboard pages. i did just that. As you can see here I used two sheets of chipboard from my stash and made the covers 6 1/2 x 6 1/2 inches. The spine I did 6 1/2 inch long buy 2 1/2 inches wide. I then covered it with black card stock. You can see many tutorials on YouTube on how to do this step if you need to. I then made two holes going down the spine with a long reach hole puncher adding the three rings where the holes of the chipboard pages are. (You will see better when you look at the pages) That is how I did the cover. 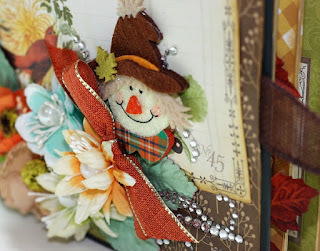 I then decorated every sheet of the chipboard pages with the paper and the embellishments that was added to the kit. 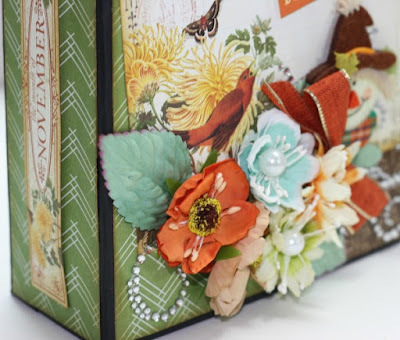 The only thing I added from my stash was the chipboard 12 x 12 sheets for the cover and some flower leaves you can get at your craft store near the flower department. Those are everywhere lately. Here is a Close up of the spine. Keep in mine the spine will be a little lumpy in the center cause the rings are there. I did not want to see the rings so I covered it up as shown above. 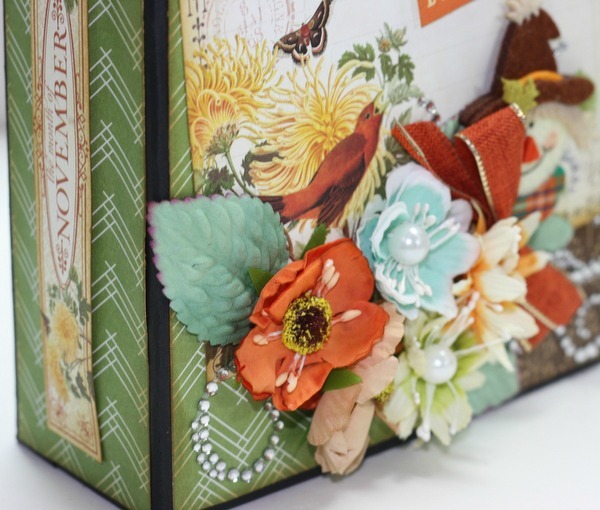 To get the ribbon like you see in the photo you cut the ribbon in half and adhere each piece under your scrap paper you added on the cover. Make its look pretty and you have something to keep you mini close shut. If you want to see inside pages of this album Please visit My Creative Scrapbook Gallery or My Blog at www.scrappalace.blogspot.com.